We do not know what image Tomás Saraceno and his team will choose for the invitation card, but conceptually we would find Hermann Minkowski’s cone-light appropriate for the show as that diagram contains all the possible future developments and all the causes from the past, making time per se and space per se vanish as they were pure shadows, quoting Minkowski himself, by virtue of an independent, for sure not Euclidean, truth. It is not accidental that in our very time, suddenly, Nikolaj Fëdorov (1829-1903)’s cosmic humanism is perceived as a topical issue along with cosmism, a rather creative and interdisciplinary movement, that moves from “The Philosophy of the Common Work “of Fëdorov and follows the path of radical projective practice and of the conscious active evolution with the purpose of a better world, in which science and knowledge are seen as means to conquer death, even retroactively in order to resurrect the ancestors. That event would put an end to the war, mother of any conflict, of generational fight. Within that prometheic dream, the generations of every time would cooperate and humankind would become a large family ready to colonize the Universe. Cosmism’s exoteric and positivist futurism deeply influenced Russian scientists and cosmonaut Jurij Gagarin, first man in space, in April 1961 on board of the spaceship Vostok 1 exclaimed in great excitement: “From up here Earth is so beautiful, without frontiers nor borders”. On February 7th 2012 “Time” magazine had this title on its cover “2045: The Year Man Becomes Immortal”. That issue contained the interview with the engineer José Cordero, who was dealing with aging transcendentally, as if it was a curable disease, while Raymond Kurzwill, futurist engineer, artificial intelligence expert, musician and entrepreneur, asserted that, perhaps already in 2020, we will be able to scan our conscience with our PC and be forever living inside it in form of software. It was maybe in an aphorism of “The Gay Science” that Nietzsche wrote that in no way he could believe in a God incapable to dance. On the other hand, it is known that the greatest biopathies are determined by fear, that is a positive emotion in itself, useful to preserve us from danger, but there are rational and irrational fears, just as there is a good cholesterol and a bad one that provokes heart attack and ictus. We need to start defending ourselves from the artificial fears induced by the continuous and limitless state of exception, citing Agamben. The contraction of fright, called freezing by the ethologists, interrupts the rhythmic pulsation of life by freezing it in the phase of contraction and it limits its expansion, which let us deduce that the dystopias of any time are reactionary and functional to some psychotic and temporary systems. Enough with the dystopias created by modernity, that let us walk around ruins morbid and pleased, moving like zombies to the funereal tune of the apocalyptic specter of extinction. The political activism of movements such as Solarpunk, the Futurefarmers fog communities and the artistic interdisciplinary community of Aerocene, moves from the real and still inexplicably underrated danger of global warming, in order to restructure our life through eco-speculation, against any determinist and mechanistic vision, by putting in relation the physical with the spiritual world and converging towards an optimistic view of the future. In so far, contradictions are meant to be a call for action: the future is not a frightening place if we imagine another modernity, similarly technological, maybe carrying on some projects that have not been accomplished yet. Those are seminal attempts to imagine such a different modernity, that reinforces our sense of nature and our being part of it, hence refusing any dynamics of the exclusion, opposing to the exclusion and to the extractive exploitation the active participation of cooperation, of crossed impollination, not at all elusive in respect of self-realization. “ Aerocene is an interdisciplinary artistic endeavor that seeks to devise new modes of sensitivity, reactivating a common imaginary towards achieving an ethical collaboration with the atmosphere and the environment. Its activities manifest in the testing and dissemination of lighter-than-air sculptures that become buoyant only by the heat of the Sun and infrared radiation from the surface of Earth. In a world of tumultuous geopolitical relations, Aerocene communicates a message of simplicity, reminding us that the air belongs to everyone and should not depend on any type of sovereignty. All in all, we should let ourselves be attracted by the purposes, rather than being dragged by causality, in order to generate living bridges towards a new age, that does no longer get hopelessly entangled in the trap of the second law of thermodynamics, dictating for each physical process the energy dissipation, the aging, the levelling, the degradation determined by the increase of entropy, which necessarily let us imagine the final consumption of the machine-world, by burning at the same time any desire to dance, to fly, to levitate we may have. Perhaps one can say that we speak too little about Saraceno and maybe he himself could think so, however, for his sixth solo show at pinksummer, we have chosen to let the artist’s work vibrate through diverse suggestions. We feel like mentioning in this regard the mathematician Luigi Fantappié who graduated from the Scuola Normale Superiore of Pisa in 1922 in the same year as Enrico Fermi did it, and who in 1942 developed “The Unitary Theory of The Physical and Biological World”. Fantappié observed that, while physics devotes the machine-world to the entropic collapse, biology and cognitive sciences let us witness the creation and the development of more and more complex and differentiated forms, which organization recall some systems that are able to increase their order and modify it in response to the environmental inputs. He searched for a solution to the aporia in the founding principles of physics and foresaw the theory of the syntropy in the sea of entropy, moving from D’Alembert’s equation describing undulatory processes. The equation admits both the solution of divergent waves, described by delayed potentials spreading from the cause source, and the one of the convergent waves, described by anticipated potentials, converging in a point that acts as an attractor, also understood as an ultimate goal. Nobody has ever considered such surplus of energy that life has available and that makes past, present and future a global structure, simply because the divergent waves are well known, while it is not possible to observe the waves from the future. Even though the presence of syntropy is thinner, like the phenomena it leads, it seems that it is equally present in the world. Syntropic phenomena are typical of life and are made right from that surplus of energy in a reduced spatiotemporal volume. They are a phenomenon of coherence in order to face the emergencies of life and in so far as they have a purposeful character. The universe would somehow contain “backward” and “forward transitions”, visible now in quantum nonlocality phenomena, which is the possibility of quantum objects to exchange information without exchanging energy in some particular status of coherence. Quantum entanglement is the name of this phenomenon, that guarantees the necessary condition for some biological processes to happen, as if energy were informed and in so far future could influence the past. Unfortunately, anticipated potentials are very fragile and it is unlikely that a status of coherence in a laboratory would last the time necessary to properly catch it as the object of an analysis. 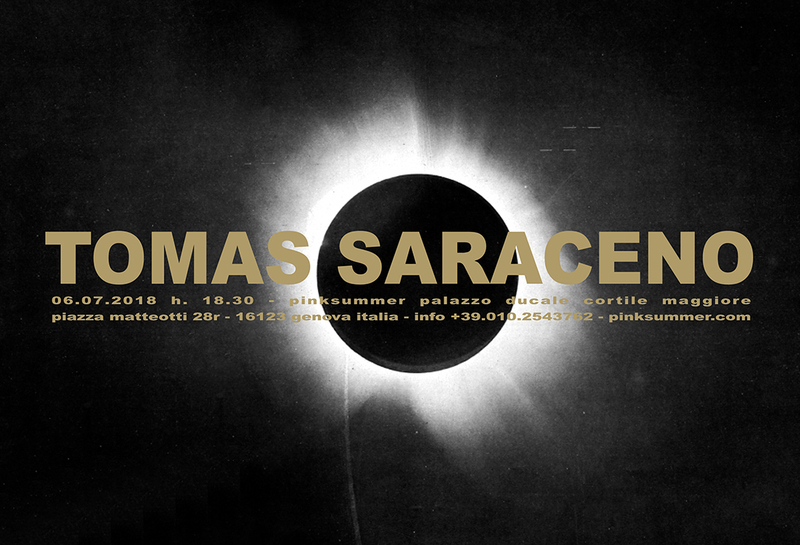 Anyway, we would like to locate Saraceno’s show at pinksummer in a future able to influence the history of a seed that its time did not let flourish as it would have deserved, a project that tried to imagine an anti-dissipative modernity, that perhaps would have not failed, leaving as a legacy the dystopic ruin of our idea of future. The exhibition, in collaboration with the Musil, Museum of the industry and the work, of Brescia and with the Foundation Luigi Micheletti of Brescia, holding Giovanni Francia’s fund, is focused on the figure of the pioneer, who knew well, like Plato, like the alchemists, that solar sulfur is a spiritus familialis, a helpful and highly democratic spirit, through which one can proceed to the major work of society transformation, with the aid of ars specularis, that by reflecting and by concentrating can generate a multitude of suns. As a matter of fact, Giovanni Francia was a modern man, who is said to ride around Genova on a red Guzzi motorbike with a bag on his shoulders, as it was a backpack, typical of contemporary city motorcycle drivers. Francia has lived and taught in Genova, but most of all he has been inventing and designing. They say he was a great mathematician, physicist and engineer, capable of catching the essence of physical phenomena in order to describe them through the pure simplicity of numerical equations. The central idea of Francia, whose “solar” career began in 1961 in Rome with the presentation of the honeycomb structures or anti-radiant cells at the United Nations Conference on the new sources of energy, was the transformation of the abundant solar heat, at low density and low temperature though, in order to obtain the temperatures needed to operate the machineries and industrial implants of technologically advanced societies. In the early 60s Giovanni Francia demonstrated to the world that it was possible to produce pressurized steam from Sun’s heat with fields of semi-flat mirrors (Fresnel type) allowing linear and punctual concentration in order to start a turbine operating a power generator, same as it happens in coal, oil, methane or nuclear power plant. The tower concentrated solar plant built by Francia in Sant’ Ilario, inside the Istituto Agrario Bernardo Marsano, drew world attention on Genoa, that in the mid of the 70s, could have been considered the world capital of solar energy. In 1970 Giovanni Francia began his collaboration with Ansaldo and in 1973, in the age following the oil crisis, when governments were sensitive to the research of alternative sources of energy, Enel, in collaboration with the European Economic Community, built Eurelios in Adrano, province of Catania, the largest thermoelectric plant connected to the national network, based on the experimentations carried out by Francia in Sant’ Ilario. Actually, we know from meta-textual critique that ergon, the work, appears always within its frame, the parergon, and with Derrida we could assert that ergon and parergon are complementary. Parergon it is the unavoidable accessory that gives place to ergon. If any representation, any topic, any text is removed from the work, what is left is the frame. The frame was constituted by the alternation in the U.S. presidency from Jimmy Carter to Ronald Reagan and by the decrease of the price of oil, that clearly determined a world-wide turn in energy politics. As a matter of fact, today the thermoelectrical invention of Giovanni Francia is more current than ever and its discovery anticipated the foundations of what are the distinguishing features of that technology. Saraceno’s exhibition will be of an immersive kind and it will include objects coming from the Giovanni Francia’s fund of the Micheletti Foundation, regarding both Sant’ Ilario solar plant and the visionary solar urbanistic project, based on modular propagation, developed by Francia in 1970 together with the architects Bruna Moresco and Kamir Amirfeiz. Also, it will be there the essay “Il Sole e i limiti dell’energia sulla terra” (The Sun and the limits of energy on Earth), written in 1974 and still unpublished, a sort of ante litteram document on greenhouse effect induced by fossil and nuclear energy sources. Once introduced in the atmosphere, even though their impact may appear modest in respect of the energy irradiated by the sun and by geothermal energy, they will take our planet, as we are experiencing, to a thermal instability causing a chain of events to positive retraction, that, if not interrupted in time, will become unstoppable because of how it acts on the causes by making them stronger. 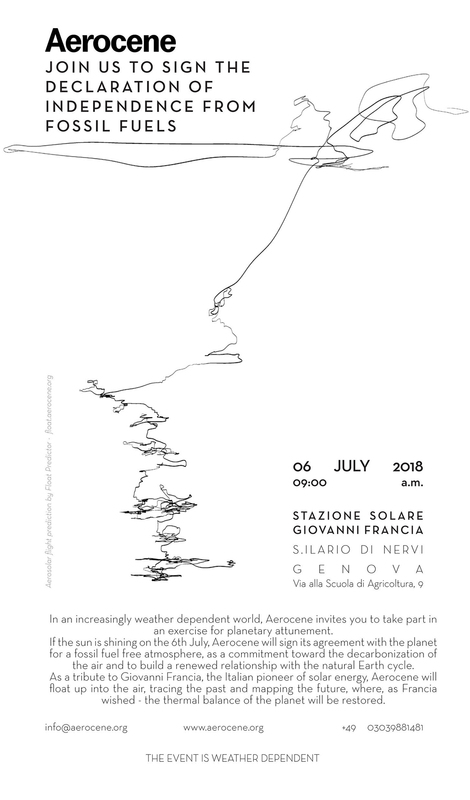 A launch of Aerocene is planned at Sant’ Ilario solar plant. We can’t do not think to american physicists and science fiction writer Robert L. Forward (1932-2002), that studied space transportation technologies, in his sequels “Return to Rocheworld” he described the photon propelled sail : like a sailing ship, which uses the contrary force vectors of the water and the wind to choose its direction, a solar sail ship uses the contrary vector of the Sun’s gravity and the Sun light…. Japanise in 2010 sent a sailing spacecraft (a nanocraft probe hanged to a solar sail) on Venus. Enrico Beltrametti, Silvia Castelli, Angela Comenale, Luigi Di Corato, Anna Daneri, Stefania Itolli, Lucia, Pietro, Laura Francia, Davide Malacalza, Daniele Mor, Gianluca Rossi, Cesare Silvi, Pier Enrico Zani.